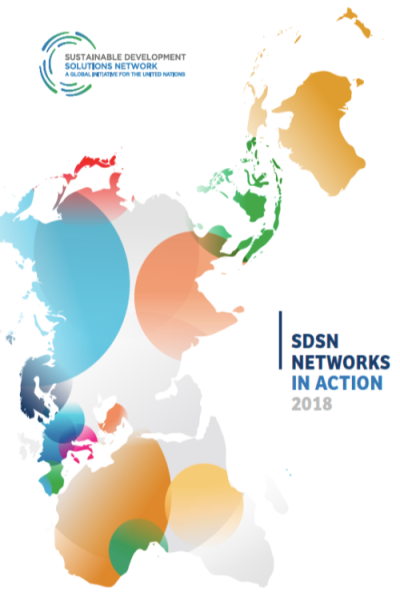 On September 24, SDSN released the 2018 Networks in Action report, a unique and comprehensive overview of the SDSN Networks Program. This year’s report opens with an introductory piece by Prof. Mariana Mazzucato on mission-oriented research and innovation for the SDGs. In it, she argues that the world today is facing complex and interconnected challenges that should be broken down into “missions” that matter to society and stimulate innovation across multiple sectors. These missions are more narrow and specific than the SDGs and should foster new creative innovations. SDSN’s networks bring together different disciplines and focus on solutions, and Prof Mazzucato concludes that they are well positioned to support these missions. Each of the SDSN’s 27 national and regional networks as well as four thematic networks are featured in the second part of the report, with a particular focus on their innovative solutions and flagship initiatives. In closing, the report details how SDSN works with our networks and the unique opportunities we provide. We hope the 2018 Networks in Action report will be useful and inspiring for all of our current and future partners - happy reading!